Lack of food security is one of the biggest challenges that Central Africans face each day as they toil in their gardens, trying to produce enough food to simply feed their families and afford other expenses in life such as health care or schooling for their children. Main factors limiting production include trees, and the lack of means to renew farming supplies. But the fact of the matter is this: how well Central Africans’ gardens do determines how well they will survive. In order to combat this form of poverty, we have found one major principle Central Africans can practice that we believe will improve their chances of survival—and that is simply to practice “diversity,” both in what they eat and in what they grow. Diversity in the diet helps to guarantee enough nutrients from each of the three major food groups of protein, fat and carbohydrate (energy), as well as the vitamins and minerals that are necessary to achieve healthy bodies and strong minds. A diverse agricultural system must be established to ensure that the proper foods are available for a family to eat. 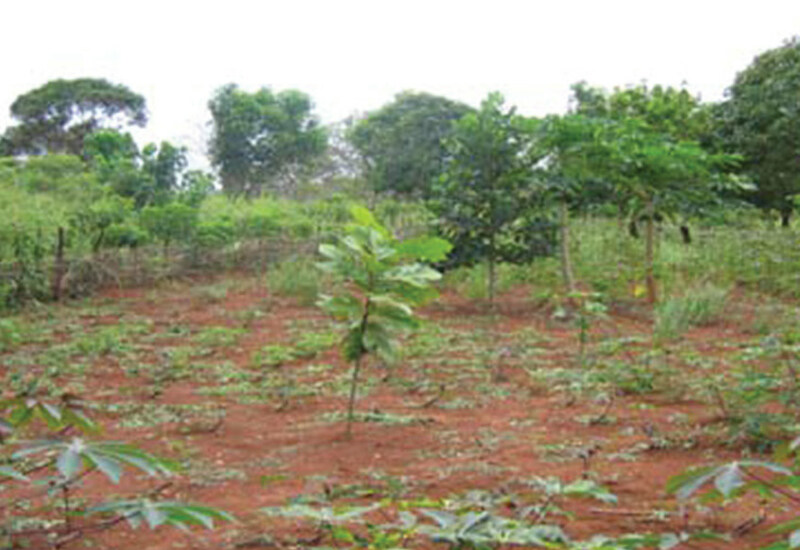 Over the decades that we have served here in Central Africa, we have found that a type of agroforestry system known as “tree gardening” has been the most successful way to promote this kind of diversity. 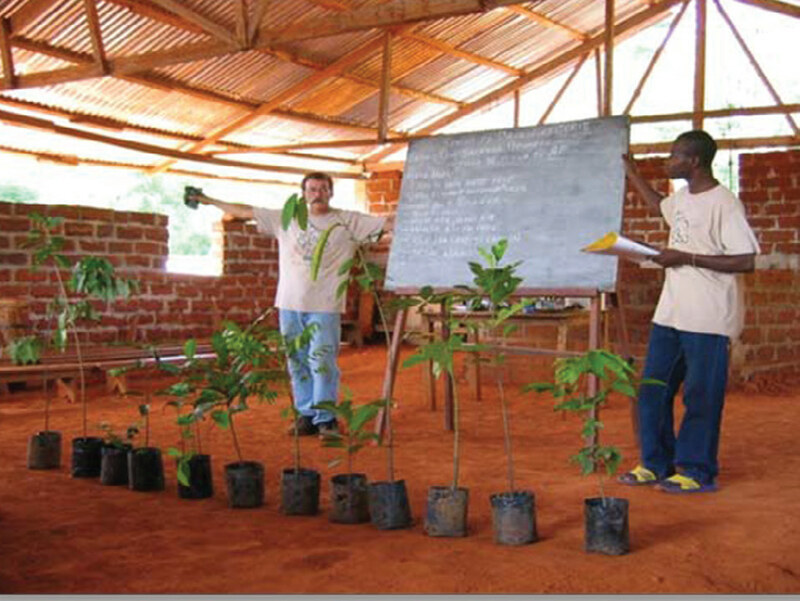 Education, via seminars, has been the method for sharing information on this kind of system, along with demonstrations and visits to Gamboula’s Garden of Eden where we have planted over 500 different kinds of fruit and other useful trees and vines. Eden is also the hub of the agroforestry part of our ministry; the agroforestry staff go out to villages (over 100 villages were visited over a 10 year period prior to the writing of this document in 2011) to train local farmers interested in establishing agroforestry cooperatives and in planting tree gardens. Our ministries here in Africa have been based on learning new ways to raise nutritious foods from both annual crops and tree crops, and then teaching others about them. After a few years, trees become the dominant planting, creating a sustainable food production system that will be available to that family for generations to come. Early on, we thought farmers who were interested in planting fruit trees could establish a fruit tree orchard next to their annual crop gardens, but we were wrong. In every case, clearing a piece of land and directly planting fruit trees met with failure, mainly from weeds not being cleared. With the onset of the dry season, dry brush and weeds are easily ignited and wildfires consume both brush and trees. But in a tree garden, because there is a large amount of space between the trees (especially when planted 8 to 10 meters apart), it makes sense to plant annual crops to utilize the space for a couple of years. As the space is weeded for the purpose of helping the annual crops grow well, the fruit trees are also weeded. Once well-established, trees need little care and will continue to produce food for decades. Where women do most of the gardening, we have seen men eager to learn to plant and care for fruit trees. This helps alleviate some of the women’s work load in putting food on the table. In cultures where a people group relies heavily on one starchy crop, such as cassava, adding additional kinds of carbohydrate sources to the diet can improve chances of survival. For instance, the mosaic virus that has plagued cassava leaves has reduced yields in many parts of Central Africa, forcing people to make larger gardens. 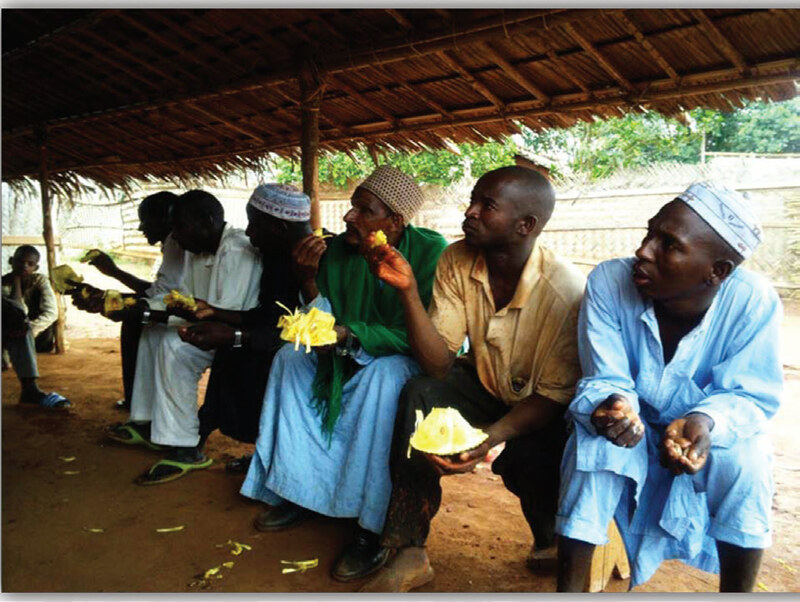 Cassava also requires a lot of labor to process for eating. Another cassava disease (brown streak virus) attacks the root and has the potential to wipe out cassava as a food source. If a farmer diversifies with other carbohydrate sources, especially ones that come from trees, he/she will require less labor to raise those crops and less labor to process them. Should one carbohydrate source become unproductive (as is the case with cassava), the farmer will still have other sources. Another benefit of the tree gardening system is the increased number of food sources for protein, vitamins, and minerals. Different kinds of fruit and nut trees in the garden certainly contribute to this. However, in our tree gardening system, we educate people on the benefits of raising beans and vegetables between the planted trees, which also improves the nutrition in their diets. The addition of trees has also helped improve soil structure and fertility. With the foliage cover over the soil, erosion is reduced and the fallen leaves return organic matter to the soil. We have also seen wildlife return and “re-inhabit” a tree garden. When seeking a place for a tree garden, first consider soil fertility and access to water. Trees, like other crops, need fertile soil to do well. Generally, places where people have chosen to plant their annual crops have decent soil fertility. Nevertheless, it will be important for the soil beneath the trees to be rich in organic matter, so look for a source of compost to mulch the ground under the trees when they are being established. Many gardens are located near streams, as the soils there generally have more organic matter (due mainly to forest trees that are also present in those locations). Sunlight is important even in a tree garden, so be careful of planting a tree garden too close to the forest, as it might get too shady. But being close to the water allows the tree gardener to hand-water the trees during the dry season. Gardens are usually far enough away from the villages that goats and other destructive animals are not a problem. However, if a garden is close enough to a village for goats to get to it, they will eat the leaves and branches and demolish the trees in no time at all! Goats are a tree garden’s worst enemy, so if your tree garden is where there are goats, build fences around the garden or around each tree. If you do not do this, you will not be able to raise trees. Yes, it is possible to plant fruit trees around a home, but all of the above requirements must be met in order to successfully raise a few trees. Spacing is important for fruit trees as well. In general, fruit trees are planted 8 to 10 meters apart. Small trees like papaya or mulberries can be planted at shorter distances. You can plant trees in rows or simply in a random fashion, depending on whether or not your space is limited. Understand that every tree has its own particular growing needs—not all trees are alike in that respect. So it is important to learn about the growing requirements of each fruit tree you want to raise. Once you have planted your trees, continual watering, mulching with compost, and protection from pests, are very important. These practices will help the trees reach their highest production potential more quickly. In summation, a happy tree is one that has a small basin around it to easily trap rain water, is mulched with compost on a regular basis, and has a fence around it to successfully keep goats from destroying it. An ideal size for starting a tree garden is around an acre or 0.4 hectare (4000 sq m). A garden of this size can easily fit 25-40 fruit trees plus beans, vegetables, and other food crops. The idea is to continue to plant trees on new plots each year until a family has enough to really increase their food security. Jackfruit (Artocarpus heterophyllus) or Chempedak (Artocarpus integer): The jackfruit is the first fruit tree to plant in your garden. It is fastgrowing, quickly produces large amounts of fruit, and has nutritious flesh and seeds that provide carbohydrates, protein, and vitamins and minerals. 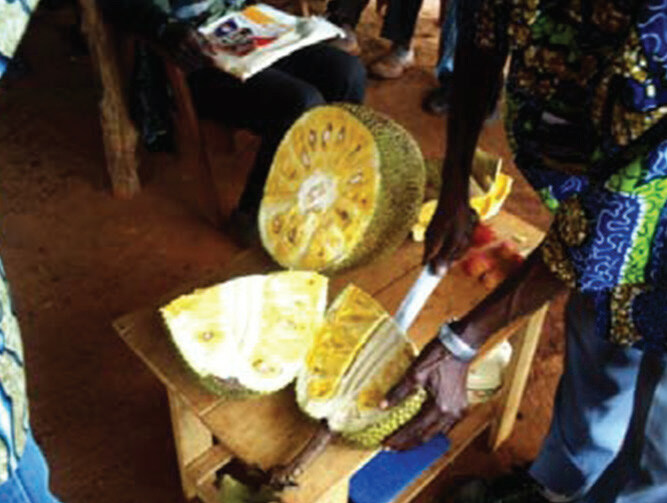 Jackfruit is highly variable as far as time to production and quality of fruit. 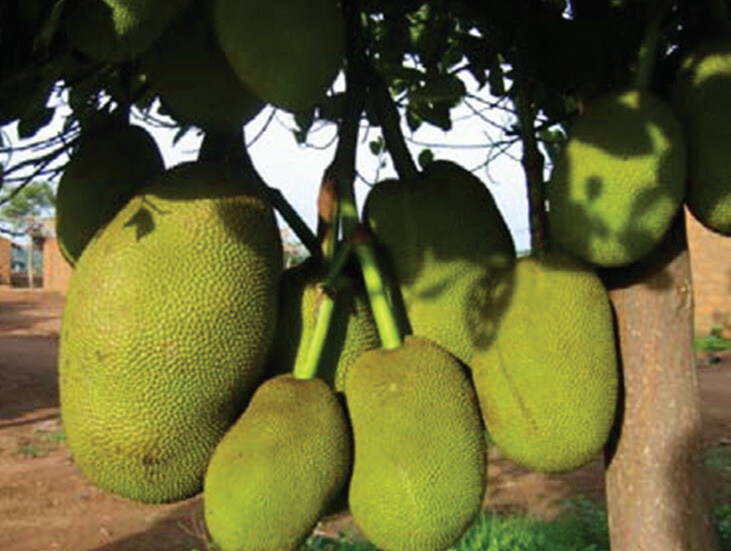 There are early-bearing, good-quality jackfruit trees established in Central Africa now and it is worth the time to find out where one is in order to get a superior variety. A close relative is the chempedak, which gets established more slowly but which some say tastes better than jackfruit. However, note that the chempedak season isn’t as long as jackfruits. Mango (Mangifera indica): Considered one of the best tropical fruits, there are many different varieties to choose from. However, not all of the best grafted varieties from Florida do well in the humid tropics, so be careful to select ones that have proven themselves adaptable to your particular region. Avocado (Persea americana): This fruit is nearly unique to all other fruits in that its pulp is creamy and oily, best eaten in combination with a carbohydrate, such as corn or bread. The many varieties differ in shape, taste, and consistency, so people often plant grafted trees if available, to get the best-quality fruit. However, the vast majority of avocados are planted from seed of selected varieties. Safu (Dacryodes edulis) is a native African tree producing oily fruit that are eaten cooked or roasted, often along with a starchy food. It is a favorite fruit tree in parts of Central Africa and a very good choice for a tree garden. Citrus spp. : This group includes orange, grapefruit, lime, lemon, mandarin, and the pummelo. All of them produce excellent pulp high in vitamin C, and are excellent for making drinks or eating out-of-hand. However, most citrus trees do not grow well in the humid tropics due to myriad insect pests and diseases. One disease called tristeza kills the whole tree and can literally wipe out a whole citrus orchard. Citrus do best in dryer, cooler regions of the tropics. Canistel (Pouteria campechiana): Also known as “egg” fruit, canistel has a texture much like a hard-boiled egg yolk, but tastes more like an extra-sweet sweet potato. This fruit has proven very popular amongst Central Africans and goes great with tea or coffee. Some varieties grow and produce in two years. Rollinia (Rollinia mucosa): Like other annona types, the rollinia is not usually a large tree. But it produces a particularly large fruit that is not overly sweet and that is delicious as a cooled dessert fruit. Bunchosia (Bunchosia armeniaca): Grown from seed, this small tree is the ultimate in fast-food of your hardwood fruiting species—it produces many small, thumb-sized fruits in only a year’s time. When the red fruits soften, they taste like strawberry jam with the consistency of peanut butter. This tree is very popular with Central Africans. Malay apple (Syzygium malaccense): This conically shaped tree produces dark red fruit with sweet white flesh. It is perhaps the closest thing to a regular apple in the tropics. Select the best, non-astringent varieties for planting. Star apple (Chrysophyllum cainito): The “caimito” or chrysophyllum as we call it here, is a handsome tree with green/gold leaves and purplish/white fruits the size of your fist. The sweet flesh has an excellent taste and the tree is usually a heavy producer. It produces ripe fruit in dry season. Banana (Musa spp): As an herbaceous plant rather than a tree, the banana can be grown just about anywhere if there is good soil moisture and compost around the base of the plant. It also likes some shade. Many varieties of the banana exist, both “dessert” types and “cooking” types. Most produce in less than a year. Currently, the banana is the most eaten fruit in the world. Soursop (Annona muricata): One of many annona types that you could have in a garden, soursop seems to survive a particular disease that kills most annona trees. Soursop is also one of the largest of the cultivated annonas. The flesh is white and sour/sweet at the same time, usually eaten fresh or made into a drink or sauce. Coconut (Cocos nucifera): One of the most useful (and widely used) fruit trees, since all plant parts can be utilized. The edible nut meat is high in protein and fat. Next to oil palm, coconut is the most frequently requested tree for purchase from our nursery. Young coconut trees are highly susceptible to termites and seem to grow best in a coastal environment or in well-weeded, rich soil. Papaya (Carica papaya): Papayas are universal, as the fruits are available just about all the time, and quick to produce. However, many varieties have poor taste or are not so sweet, so be careful to select seed from good varieties (e.g. Red Thai). African Oil palm (Elaeis guineesis): An African native species, oil palm is adaptable to almost all soils. It is the number one cooking oil source for all Central Africans. The oil contains vitamin A which is often lacking in the Central African diet during dry season. Selected hybrids of this species are extremely productive. Governor’s plum (Flacourtia indica): This highly productive tree potentially bears heavy crops of small (2 cm) fruit, with flesh resembling a plum. Fruits are eaten fresh or made into jams. Plant a grafted variety—otherwise production could be disappointing or not at all (especially if you end up with a male tree!). Mulberry (Morus spp. ): The dark red or black mulberry tree is grown from cuttings and can begin production in less than a year. Under ideal soil conditions and moisture, it can yield several crops a year of sweet delicious fruits that are excellent for jams, drinks, or in salads. Moringa (Moringa oleifera): A fast-growing, versatile tree with edible leaves, pods, flowers, and roots. Highly nutritious, but a little bit spicy hot—hence the name, “horseradish tree.” Moringa tends to grow better in areas not consistently hot and wet. Rambutan (Nephelium lappaceum): One of the best tropical dessert fruits, with a very sweet, firm, yet juicy flesh, similar to the grape and related to the litchi. Generally, several trees are needed for good pollination and fruit production. The tree takes several years to grow and produce, but it is worth the wait. Mangosteen (Garcinia mangostana): Known as the “queen” of tropical fruits, mangosteen is one of the most perfectly delicious dessert fruits known to humankind! Though the tree takes 8 to 10 years to begin production, every garden ought to have one. Malabar chestnut (Pachira glabra): Also known as the “peanut” tree, this fast-growing and adaptable tree is an excellent source of protein. The tree will practically grow on rocks and in other horrible soil conditions. The thumb-nail size seeds are harvested after the pods explode, and are eaten raw or roasted in a pan. Passionfruit (Passiflora edulis): Yellow passionfruits, both sweet and sour varieties, make excellent juice and are high in vitamins A and C. The giant passionfruit is always sweet and has a different flavor than the smaller yellow varieties. Both plants are vines and must be raised on supports. Purple passionfruit is good for highland areas. Guava (Psidium guajava): Guava trees seem to be everywhere in Central Africa. They are highly productive and very useful; fruits are best eaten out-of-hand but are also used to make jams, sauces, and juice. Breadfruit (Artocarpus altilis): Probably the best source of carbohydrate from a fruit tree. Breadfruit can be prepared in many ways much as the cassava root can—roasted, mashed, boiled, or French-fried. This handsome tree is only propagated by root cuttings, and does best in the warm, humid tropics with a short dry season. Pineapple (Ananas comosus): This small, unusual plant—a bromeliad—grows in just about any kind of soil, but likes warm humid regions with a three to four-month dry season. The plant produces one delicious sweet large fruit, highly prized by most people. Many varieties exist, so select planting material from a good-tasting sweet variety that is already growing in your area without regard to color. Some of the less colorful fruit are the sweetest. If not already growing in your area, test the new variety out, which is what we have done with so many introduced species in Eden. Some people prefer to plant fruit trees around their homes, which is a good idea because they can keep an eye on the trees as they care for them. When a fruit tree produces, the owner can keep track of the fruit so it doesn’t walk away! However, in the village, soil is usually more compact, less fertile, and more difficult to water. Besides, space in a yard is limited so that only a few trees can be planted. A wide selection of fruit trees adds to the diversity of a food security system. We are not suggesting that you eat only fruits and nuts, although that would be a worthy challenge to try to do on a daily basis! Rather, we suggest Tree Gardening in addition to other food crops that locals are used to growing and eating. Increasing diversity by eating new or different foods more often will not only improve your health, but will add enjoyment and sweetness to your existence.